Citation Information: J Clin Invest. 2007;117(12):3930-3939. https://doi.org/10.1172/JCI32578. 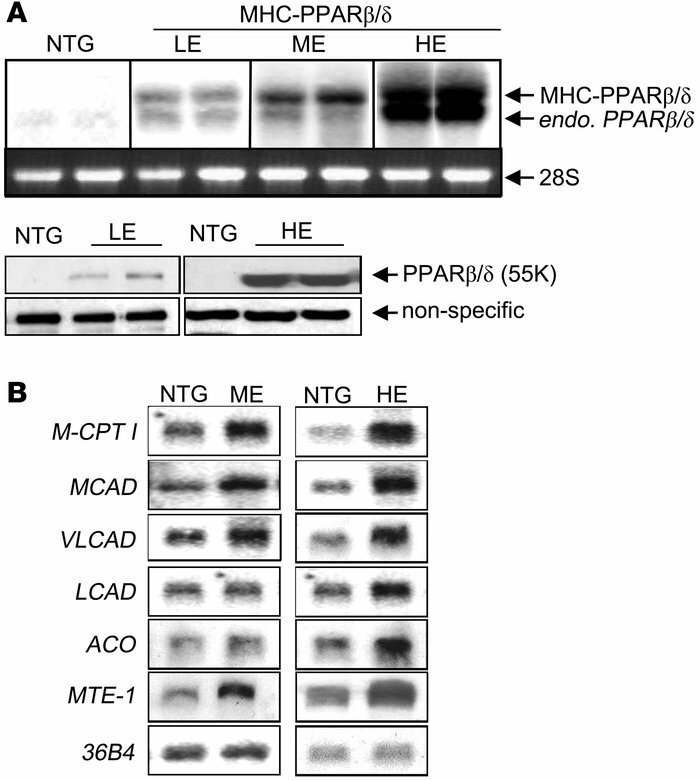 (A) Top: Representative autoradiographs of Northern blot analyses performed with RNA isolated from hearts of 8-week-old mice from independent MHC-PPARβ/δ–LE, MHC-PPARβ/δ–ME, and MHC-PPARβ/δ–HE lines. At the exposure shown, endogenous (endo) PPARβ/δ was not detected in NTG samples. Note that the endogenous PPARβ/δ transcript was induced in the transgenic heart (lower band). The 28s rRNA is shown as a loading control. Bottom: Representative Western blots performed with protein isolated from cardiac ventricles of MHC-PPARβ/δ–LE and MHC-PPARβ/δ–HE mice. The nonspecific signal is shown as a control for loading. (B) Representative Northern blot showing the expression of known PPARα target genes in hearts of MHC-PPARβ/δ–ME and MHC-PPARβ/δ–HE mice. The 36B4 signal is shown as a loading control.